IT ISN’T UNCOMMON for fly tying fanatics to think about selling flies for extra money, but those who take that next step quickly realize that some fly patterns are too complicated to yield any profit. This is especially true of ultra-realistic flies, many of which can take hours — if not days — to tie. The other obstacle keeping realistic flies out of the fly bins at local fly shops is that they aren’t usually fishable. 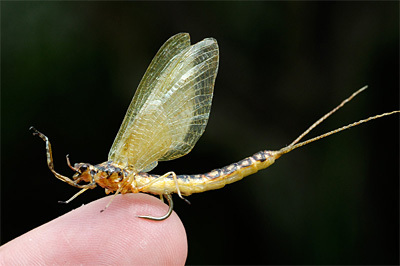 Realistic duns sink like a rock, and realistic nymphs often don’t offer the same movement as naturals. In essence, realistic fly tiers are creating art. And like most art mediums, there is a small contingent of collectors who seek out their work. Some realistic flies have sold as high as $5000 for a single fly, usually mounted in a natural setting and framed in a shadow box. And then you have realistic fly tier, Graham Owen. Graham has been tying realistic fly patterns ever since reading Oliver Edwards’s book, Flytyers Masterclass. Initially, Edwards inspired Owen to look for ways to make his fishing flies more realistic. Graham later took the fascination with realism one step further and began creating realistic fly patterns as art. Owen began displaying some of his work on his website, www.grahamowengallery.com, and in mid-2007 he was contacted by Paramount Pictures, who was in the midst of producing the film The Curious Case of Benjamin Button starring Brad Pitt. The film’s director wanted to zoom in tight and show Brad Pitt offering a small honey-pot full of flies to his breakfast companion. The filmmakers had tried using raisins, some with brown shoe polish applied, as well as pieces of paintbrush bristles stuck into the raisins. The director was displeased, and lucky for Owen, they stumbled across a realistic housefly Owen had displayed on his Web sit. I don’t sell anything for less than $100 each, and these lower prices are typically limited to houseflies and mosquitoes. I’ve sold hundreds of bees for $300 each, and scorpions are currently my most expensive item. GO: Word spreads pretty fast, especially when new products become available, and shortly after fulfilling the order for Benjamin Button I was contacted by Universal Pictures, who wanted 20 houseflies for a movie called Cirque Du Freak. I filled the Universal order and decided to explore the possibilities of making this a full-time business. The first thing I did was make a business plan, starting with how much income I need annually, divided by the number of flies it would take to achieve my goal. I’ve known for some time that I could never make a living tying realistic fishing flies or display flies. Potential buyers would often gasp and hang up the phone when I quoted prices that start at $100 each, while the studios buy them by the dozen, sometimes hundreds. AC: How hard has it been to make a name for yourself in Hollywood? GO: Several things have made it easier for me. First of all, I live in Burbank, CA, home to a number of big studios and prop buyers. Couriers find it convenient to simply stop by my house to place or pick up orders. Second, I worked as a solar energy contractor for twenty-five years, specializing in high-end custom installations, and a sizable percentage of my client base worked in the entertainment industry, including actors, writers, producers, directors, etc. I sent letters to quite a few people, introducing them to my products. I received a number of interesting responses, most notably from writers, informing me that bugs are deliberately excluded from scripts because they are difficult subjects for directors to keep under control. Another interesting aspect was learning that the major motion picture studios work in compliance of American Humane Association filming guidelines, which prohibit the use of any dead animal as a prop, including insects. I’ve even created replacement worms and scorpions for tequila bottles that needed to be filmed. 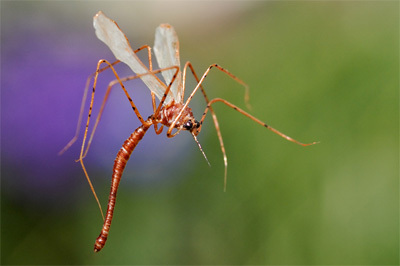 Owens’s cranefly. AC: Have you found that tying realistic flies for Hollywood is easier than tying realistic flies for fly fishers? Is there a clear line between what the average tier would consider a fly and your creations? GO: It depends. Some projects are very challenging, such as creating butterflies with flapping wings for Disney. My neighbor across the street owns a shop that makes robotics for the studios, and luckily I was able to get some helpful hints about working with internal muscle wire, a product that contracts when heat is applied using electric current. I recently created slugs to be pulled out of Robert De Niro’s ear in the upcoming movie Little Fockers. I didn’t even use a vise, instead, I poured some liquid latex on a piece of glass to make the underbody flat on one side, then, I built it up with chenille coated with acrylic varnish. I like to tie everything with thread, and fold tag ends of materials over, and then add a couple more wraps. The results are stronger flies. I have no fear of legs or wings falling off, and it is actually easier to finely place and adjust things. I have also created a number of bugs with hollow abdomens, to allow for filming fluids being extracted with a needle and syringe, and typically I tie a mono frame over the rear of the hook and cover it with several layers of swiss straw sealed with acrylic varnish. This summer Angelina Jolie’s movie Salt will be in theaters, and you can see a needle extracting fluid from a spider. AC: How much does it cost for a studio to use your flies? Do they usually rent or buy them outright? I recently created slugs to be pulled out of Robert De Niro’s ear in the upcoming movie Little Fockers. I didn’t even use a vise, instead, I poured some liquid latex on a piece of glass to make the underbody flat on one side, then, I built it up with chenille coated with acrylic varnish. GO: I prefer to rent my products, in an effort to minimize inventory shrinkage, but that only works out about 50 percent of the time. With respect to pricing, I don’t sell anything for less than $100 each, and these lower prices are typically limited to houseflies and mosquitoes. I’ve sold hundreds of bees for $300 each, and scorpions are currently my most expensive item. Last night I watched the TV show Breaking Bad, Season 3 episode 10, titled “Fly,” which featured my realistic flies, and the producer recently ordered nine more flies, embedded in clear lucite blocks, as gifts to the writers, director and other producers. Last year I filled an order for 212 white maple spanworm moths for Adam Sandler’s film, Grown Ups, which was one of my highest-paying orders to date, and I wish I could have rented those instead of selling them. AC: Besides television and film, are there any other media outlets that have used your flies? GO: Last year I tied 50 realistic bees for Mikimoto Pearls’s Rodeo Drive and Fifth Avenue spring window displays. I work with a growing number of commercial photographers who rent my bugs as props. One photographer has used my bees and a butterfly in cosmetics photo shoots. And another photographer rented fireflies for a Georgia Power advertisement, in which a jar is filled with enough fireflies to allow a person to read a book under the light.